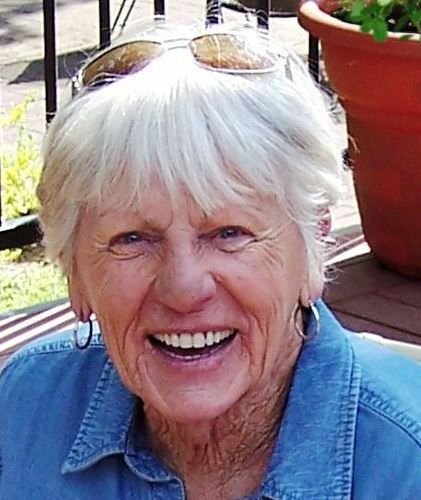 Margaret Patricia ‘Peg’ Hanretty-Morin (age 90) of Napa, CA, passed away peacefully in her home on Friday, November 16, 2018. She was born to the late Lawrence Joseph Hanretty and Ruth Mildred Carter-Hanretty on May 24, 1928 in San Francisco, CA. She attended St. Monica’s School in San Francisco, Napa’s St. John’s Catholic, and Napa High Schools. She was married to the late Lawrence Arthur Morin, and raised (wrangled) eight children as a single mom after his passing in 1962. Peg was an independent and active woman who enjoyed cooking, swimming, water and snow skiing, the family dogs, shopping, watching her PGA ‘boys’, and playing league bocce ball before her health began to decline. Peg’s greatest passion was her yard. She devoted years of countless hours to make it a park-like setting for all to enjoy. Peg was a longtime employee of Alfredo’s Pizzeria and worked at various other restaurants in the Napa Valley. She was also a personal chef for the De La Salle Christian Brothers who staffed Justin High School. She enjoyed their company immensely, and took great pleasure in planning creative menus for the appreciative Brothers. She eventually opened PS Deli Delicious with her longtime friend, the late Shirley Bonner, serving the Napa community for 12 years under their ownership. After selling the deli, Peg worked in the delicatessens of Vallergas Market and Safeway until she retired to work in her yard full-time and continue to hone her culinary skills—much to the delight of family and friends. Peg is survived by her eight children, Lori Fitch (Bill), Pat Gallant (Jon), Larry Morin, Gwen Turner, Suzi Medlin (Bob), Cyndi Morin (Dan Kent), Will Morin, and Katie Cates, 12 grandchildren, 14 great-grandchildren, her brother James ‘Jim’ Hanretty (Mary Ann) of Larkspur CA—whom she adored, many nieces and nephews, and countless other loving relatives and close friends. She was predeceased by her younger sister Barbara C. Sisler. For those who have known Peg in her journey, please join us for a Celebration of Life service to be held on Saturday, December 8, 2018 at 11:00 am at the Tulocay Chapel, 411 Coombsville Rd, Napa, CA, with onsite luncheon to follow. The family wishes to thank Dr. Andrea Clarke (her primary care physician), and the administration and support staff of Kaiser Hospice—with special regards to Justine Hall, Lucy Franklin, Jennifer Roque, Michelle Saint-Cloud, and Robin Johnson—all of whom provided exceptional care for Peg and her family during her 14 months as a hospice patient. The family would also like to thank Linda Clark, Peg’s part time caregiver, for her many months of conscientious care. As Peg loved all animals—especially rescue dogs—the family suggests sending memorial contributions to the Napa Humane Society in her name.